Calibrating scale testing requirements have become more complex, requiring that the scales survive years of use in rough industrial environments. Ensuring scale calibration is key to extremely accurate and efficient production. If a scale is not calibrated, it can significantly cost a company financially, and even worse, it can damage its reputation. 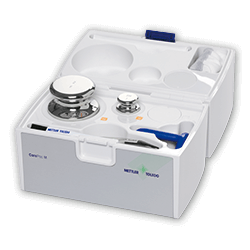 METTLER TOLEDO’s calibrating scale/test weights are perfectly designed to support testing and calibration of industrial scales. With a strong engineering focus on safe and productive testing, cast-iron weights up to 5 tons are perfect for this application, satisfying even the most stringent testing requirements. 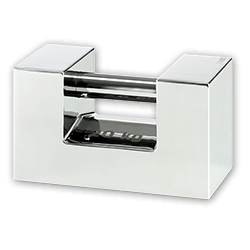 For washdown and hygienic environments, high-grade stainless-steel weights are the perfect choice for the best performance. These test weights are available in different shapes and accuracy classes to ensure proper scale calibration and scale recalibration. 1. How do you calibrate a scale? With large stainless-steel test weights of up to 2 tons, calibration laboratories rely on the exceptional value that our test weights offer. METTLER TOLEDO offers an extensive weight portfolio for the calibrating scale that covers weights from 1 milligram to 5 tons in all accuracy classes. From grip-handle weights to cylindrical weights, each type of test weight offers its own set of benefits during scale calibration and recalibration. Some grip-handle weights, for example, are ideal for clean room and washdown applications, while others feature welded construction and a glass-bead-blasted, passivated surface that is for heavy-duty operation within harsh environmental conditions. 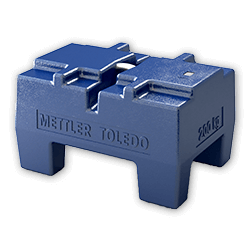 To avoid manual handling operations during scale calibration and scale recalibration, METTLER TOLEDO has designed weights that offer a myriad of lifting options as well. For a calibrating scale job, workers are exposed to certain risks by handling heavy-capacity weights. Some of the design features include 360-degree access by forklifts, cranes and hoists. This helps workers avoid injury by minimizing manual handling hazards during scale recalibration. Stackable cast iron and stainless steel weights for scales with maximum capacity of several tons. Stainless Steel and cast iron grip handle weights for testing of scales with maximum capacity up to 200 kg. Weights according to OIML and ASTM for Analytical and Precision balances with maximum capacity up to 50 kg. Balances or scales should always be checked with reference weights that you can rely on and trust. Our accredited mass laboratories clean, calibrate and adjust your weights, then document the results in calibration certificates with details of conventional mass correction, uncertainty and traceability information according to ISO/IEC 17025. Our unmatched global network of 14 calibration laboratories across Europe, the Americas and Asia guarantee fast and cost-effective mass calibration. Our metrology staff are passionate about their calibration work, to ensure you receive first class service as well as continuously improved results. The combination of robotic technology and world-class mass comparators delivers proven reliability and outstanding measurement performance. Scopes range from OIML E to M classes and ASTM classes. For heavy-duty weights, services cover all steps from re-painting to calibration, even for weights up to 5 t.
Weights up to 50 kg undergo treatment in a total of six separate customized baths. Each weight is cleaned and stabilized in a fully automated process prior to calibration to ensure uniform surface conditions. As with laboratory balances, industrial scales and weighing platforms are also subject to regulations that ensure measurements are reliable and meet legal requirements. Regular testing with adequate test weights is essential. METTLER TOLEDO’s grip-handle and heavy-capacity weights are suitable for any application in all types of industrial environments. Choose the weight that best suits your needs out of our wide range of stainless steel and coated cast-iron weights from a nominal value of 1kg up to 5000 kg. METTLER TOLEDO's world-leading expertise in metrology extends to weights, weight sets and weight calibration services. Our weight portfolio covers OIML weights from 0,05 mg to 5 tons in all accuracy classes. Our weights are used all over the world not only for testing balances but also as primary standards in mass laboratories. For our weights, we source only the finest quality austenitic steel which offers the highest resistance to corrosion over the course of a weight’s lifetime. Our unique manufacturing process involves melting the steel under vacuum, polishing it using traditional mechanical methods, performing an electrolytic final-stage polishing, cleaning it in a fully automated process and then calibrating it using state-of-the-art mass comparators. This process has been perfected over years of experience to bring you accurate weights of the highest quality with a stability that remains unmatched in the market. Weights are the most frequently used and important equipment for testing scales and balances. And as such, they need to be handled with care. For these and other important suggestions that extend the usable life of your test weights and improve your ongoing weighing accuracy, simply register below to download your free copy of "Correct Weight Handling—12 Practical Tips"